After the spectacular opening of the 10-11 theatre season, we really didn't have an idea of where things were going as far as who has the dominant season. Most won't admit it, and to be honest most don't care anyway, but there are some years you have an idea of who has the biggest set going into the new year based off the first production. However with striking performances backed by sellout crowds for every company, not to mention the influence from new underground productions, this season remains in the air and is looking to be remarkably creative one for all involved. So its only fitting that the first play coming back be one of passionate dramatic taste. Josh: So my wife and I are economic refugees from southern California. We've made a wonderful home for ourselves here in Utah, and have been pleasantly surprised by the artistic opportunities available. Deena: I work in professionally as an actress. I also model, work as a YouTube partner and make weekly videos for the City Weekly website. 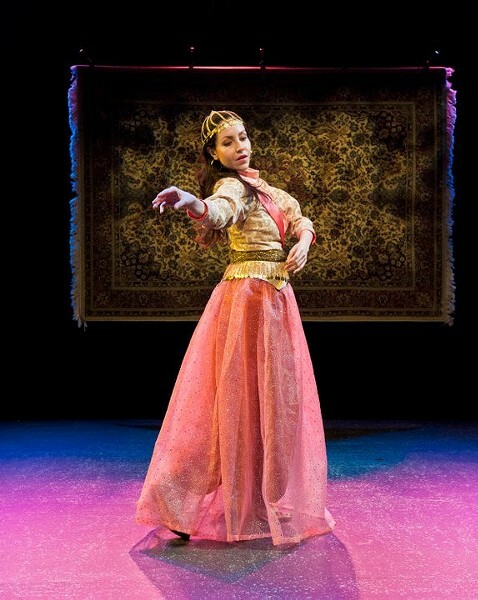 Andra: I'm Alexandra (Andra) Harbold, and I'm the director of The Persian Quarter. I was born in Texas, grew up in Virginia (with a few years in Arkansas), went to college in Vermont, grad school in London, and have lived in Seattle, NYC, and Chicago as an adult. My husband and I moved to SLC six years ago. Gavin: What inspired all you to take an interest in theater, and what were some of your first productions? Shane: Theatre is a performance art. As a child I found it very easy being around adults and could easily keep their attention. So performance was just second nature. It’s only as I got older and studied theatre that I began to question my abilities as an actor. What I consider to be my first production happened almost by accident. I was at my mom’s office when I decided to walk over to the theatre where I had taken some summer classes and been cast in a production of Cat On A Hot Tin Roof just as they were auditioning for A Thousand Clowns. They asked me if I wanted to audition... and the rest is history. Josh: My mom used to take me to plays and I loved them. The performers looked like they were having a lot of fun. The first play I did was called Jack The Giant Killer. It was a children's theatre production, and I was Jack. And I got to kiss a girl. So that was awesome. Gavin: Kathleen, last year you debuted Charm for local audiences. What was that play and the season like for you, and what did you think of the response it received? Kathleen: I loved doing Charm at SLAC. And I love doing The Persian Quarter there. I feel so lucky to have a theatre in the city where I live, where I can bring my work. There are few playwrights in this country who are fortunate enough to have that kind of situation. I'm a better playwright because of it. Gavin: How did the idea come about for The Persian Quarter? Kathleen: Inspiration comes, when and where it comes and it's not really a conscious process... I'm just thankful when it comes. I wrote Charm because I started dreaming about it. 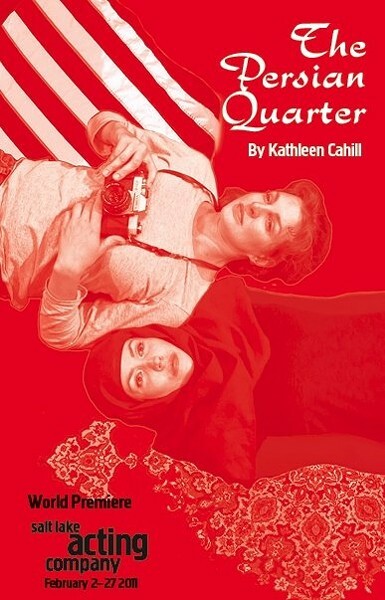 I wrote The Persian Quarter because as I watched the televised protests in Teheran in 2009 -- where I saw Iranian women in their black chadoors, risking their lives to go out into the street and demand their freedom. As I watched these events, it trigged memories of my experiences in Iran over thirty years ago. Many of these memories were about events I hadn't given a thought about for that many years... but they started coming back to me. I began to see the big world of international politics like a monster that affects our lives in ways we don't realize or understand. And I began writing scenes. The play was originally a one act. It only became a full length play over time. Gavin: Alexandra, what motivated you to want to take on directing this particular play? Andra: A number of things. I had the opportunity to be Meg Gibson's AD on Kathleen's play Charm last season and to witness that process from the inside. Kathleen creates incomparable journeys for actors, and she writes particularly wonderful adventure tales -- quests -- for women. Her roles require a mercurial mind, muscle, endurance, humor and courage. The Devoutly to be wished for stuff. I think the questions Kathleen asks herself get contagious. Or she wakes you up to your own questions. 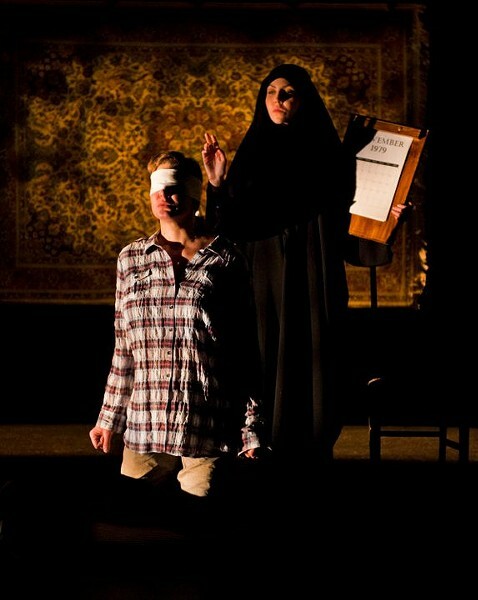 I wanted to direct The Persian Quarter because it contends with poetry and politics in the same breath. Gavin: How has it been like for you taking the source material and fully putting everything into production? Andra: It's been an obsession. Whenever you have the opportunity to work on a project you love, I feel like source material finds you. Gathers on your doorstep, waits for you to turn on the radio, seems to be everywhere you look. Because of The Persian Quarter, I feel a connection to Iran and our shared history now that I would never have had otherwise. I have a new love of Rumi's poetry and a renewed love of Emily Dickinson. Gavin: For the actors, what was it about this play that caught your eye to audition for it? Josh: Having worked with Andra on Prophets & Storage (a reading at Plan B), I was keen for an opportunity to work with her on a full fledged production. Shane: The fact that my father is Persian and that I had been in two productions at SLAC before perked my interest when I heard about the audition. I have often been told I “think too much” or that I frustrate other people because I think too deep. Once I read the script I knew the only character I could relate to was Rumi. And the fact that I am Persian didn’t hurt. 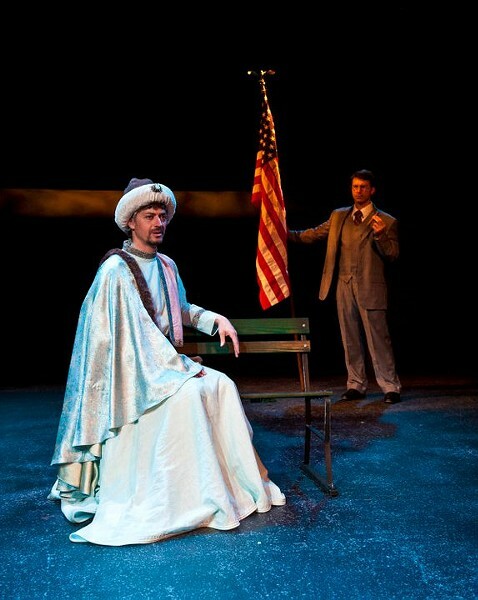 Deena: I was asked to be a part of the staged reading of The Persian Quarter last year at Salt Lake Acting Company. 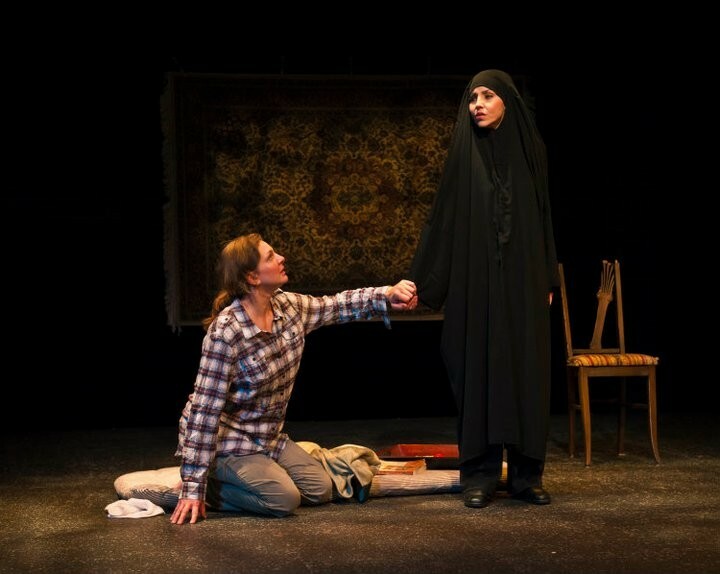 I played the same roles I am playing now, Shirin and Azadeh, the two Iranian female characters. Working on it then, I started to fall in love with the script. I read for the same role in auditions and was cast. Gavin: What was the audition process like for each of you and what was it like getting the part? Shane: I haven’t performed on stage for twenty years. So I knew I needed to be prepared if I were going to audition. Being memorized for the audition was key. I also wanted to have some back up monologues just in case they wanted to seem my diversity. When it came down to it the audition was much easier than I thought it would be. Now that I’m older and have some life experience under my belt I don’t care so much what people think or if I get the part so I was much more relaxed for the audition. 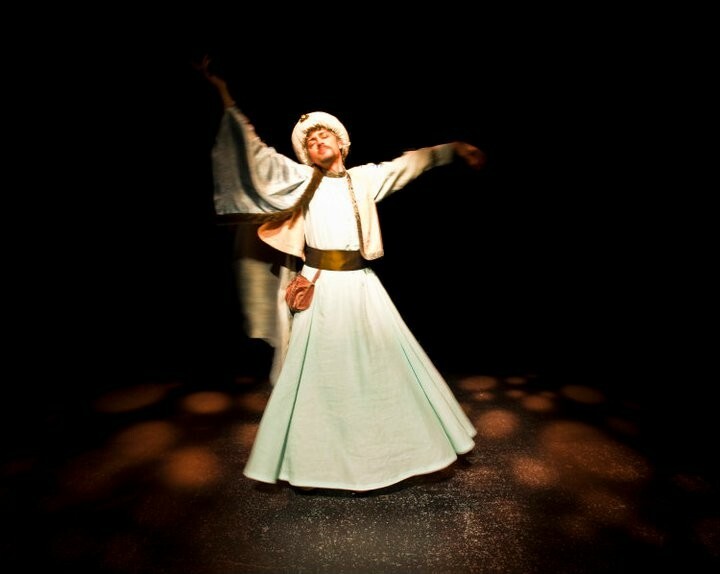 To be cast for the part of Rumi without a callback was a boost to my confidence and rekindled my childhood excitement to perform. Deena: Even though I’d done the reading, I didn’t know what the outcome of the casting would be. I never assume. I approached it like any other audition. I remember thinking there were so many people there. I was hoping for it, and going to put it out of my mind until I heard anything. The next morning I got the call I was cast. At callbacks I got to read with a few actresses up for the American female role as my scenes are only with the other woman. They were all great. Nell came in last and I thought right then the two of us in particular had a different kind of chemistry together. I think we all knew right then. Josh: I think by the time I was called back all of the other parts had been cast. I did several readings with Nell and got the role. 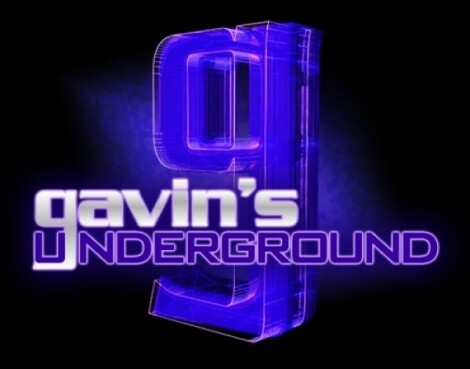 Gavin: Considering the material, how has it been for all of you fitting into these roles? Deena: Challenging. It’s been a gigantic undertaking. From learning a new dialect, to developing two different characters, to a little stage combat, to learning a Persian dance, to changing my hair color. The structure of the play different too, and takes a lot of stamina. I find what with the weight of the material, and the amount of memorization I’m mentally drained by the end of the rehearsal week. It was great for me to realize there are moments where the two female characters, despite such different beliefs, are at times relating to each other simply as two women. There are humorous moments too. Josh: A lot of fun, despite the darkness in the material. It's easy to do when you're supported by a great cast and production team. Shane: To embody the divine or live up to the expectations of what Rumi represents to so many people that love his poetry is a bit elusive. What I didn’t realize until I started researching this character is how intertwined east and west religious ideas and beliefs are. To be the observer of oneself or one’s ego through this journey of life is key to the reality we each experience and what it all means in the end. Gavin: What's the interaction been like for all of you, both as actors and as the characters? Shane: I feel like a guest that has been invited to work with professionals so that I can learn more about myself at this stage in my life. Creatively it is a blessing for me to explore again what it’s like to play. Receiving feedback and allowing myself to be directed somehow stirs those childish insecurities but reminds me again what it’s like to feel vulnerable and open to possibilities. Which is a good thing not to forget as I settle into adulthood. Josh: It's a small cast of extremely talented performers, if I may be so bold. Everyone has risen to the occasion, and is having fun in the process. 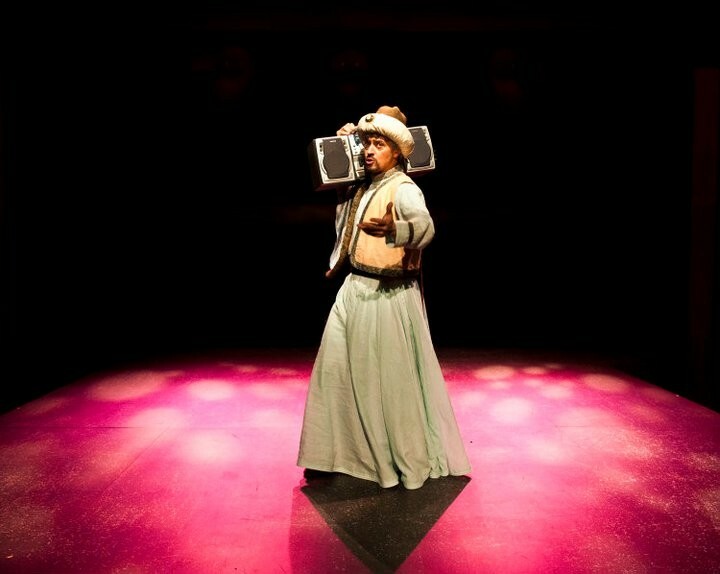 Deena: What I love about this play most, are the words. I love poetry and words. This play is very poetic, passionate and beautiful. “You think we are Persian cats and Persian carpets. We are a nation of poets, we think like poets.” Who gets to say lines like these? This piece is important, you’ve never seen anything like it. It’s not a hit you over the head political piece. It’s stunning, engaging, alive. It’s magical. I am confident every type of person will connect with and enjoy something about it. Expect the unexpected with this one. Andra: I can't wait! And I wish time would slow down a little. It has been a joy to work on The Persian Quarter with Deena, Josh, Nell, Shane and Kathleen. Josh: Everyday, this play seems to become more and more timely, what with the current unrest in Tunisia and now Egypt and Yemen. I'm curious to see the position the US takes this time around. Deena: I feel very lucky to be able to be a part of this and excited to show an audience what we’ve all created. Gavin: Moving state-wide, what are your thoughts on local theater, both good and bad? Shane: Salt Lake has a strong theatre base and the public wants to be entertained. But there is so much competition for those entertainment dollars particularly with ever increasing technology and media advances. Local theatre has yet to become a cultural event like it is in New York where the ambience screams live theatre and just makes you want to go see a show. I think it would be a step in the right direction to build a Broadway theatre in Salt Lake. Just look at the touring productions that come in form NY & LA. Locals can’t jump on them fast enough. Josh: When my wife and I got to Utah, we were amazed at the amount of theatre that was and is happening. I'd never really thought of it as a promising destination for working actors. I've been thrilled with the opportunities that have come my way out here. Gavin: Is there anything you believe could be done to improve on it or make it more prominent? Josh: Just keep using the incredible local talent that Utah's got. Shane: Like any other marketing campaign you have to get your audience while it’s young. Get the kids hooked, they’ll grow up loving it and come back for more. Live theatre is just another animal all together. It’s easy to mass produce a film and formulate a return on investment. But live theatre is labor intensive which is the highest cost of any business model. Sports arenas cater to the masses and serve alcohol and over priced food. Live theatre is more intimate and not as easy to mass-produce. So... no. It is what it is. Gavin: What's your take on the push to bring “Broadway to Utah” and the steps being taken so far? Josh: I'd rather they mount a production of a Broadway play here, rather than import a touring company. Local talent could more than rise to the occasion. Andra: I am playing Theresa in Salt Lake Acting Company's next production, Circle Mirror Transformation. Deena: More of the same but also something new! In March I’m training to become a Zumba instructor! Shane: The LDS church is auditioning for a film version of the New Testament, which should be in production early spring. It would be nice to be involved in that project. Here’s crossing your fingers! Josh: My celtic band, Bad Colleen. We're based out of Ogden and have only just started playing around town. We're aiming to make the leap to SLC, so keep your eyes (and ears) peeled. Deena: All links, updates and info are on my website DeenaMarie.biz.